A little bit of salt is a beautiful thing. I’m not talking about the pounds of sodium poured into frozen dinners and packaged snacks to overcompensate for lack of flavor. I’m talking about a smidge thrown on a just-cut summer tomato, a healthy pinch tossed across a porterhouse before it hits the grill, a sprinkle of salt that brings out the natural flavor of real ingredients. Salt, when used in the home kitchen, makes every dish taste that much better. And there’s a way to finish your foods with an even bigger flourish. From the old standby of Mrs. Dash to an artisanal jar of alderwood-smoked salt, we’re all familiar with the way a little extra seasoning added to regular NaCl can boost its power exponentially. Well, why not do it at home in five minutes? Over at iVillage, I’ve shared four recipes for homemade flavored salts, from smoky to zesty to super savory. For recipes that incorporate dry ingredients only, such as the cocoa-coffee salt or the porcini salt I’ve shared on iVillage, creating an intensely flavorful salt is as easy as blending the ingredients together in a food processor or spice grinder. Once you have the basic technique down, you can make flavored salts in any combination your little heart desires. (Well, try the cocoa-coffee salt first, because it rules, and then start experimenting.) I’ll even give you a bonus recipe below to get your creative juices and salivary glands flowing. The best part about making your own flavored salts, apart from the mad-scientist aspect, is the relative inexpense of each experiment. Salt is one of the most valuable kitchen staples, yet costs mere pennies per cup. And the few teaspoons of added ingredients mean you can play around with pricey things like dried porcini mushrooms (or saffron, or fennel pollen) without blowing the grocery budget. As for that bonus recipe? 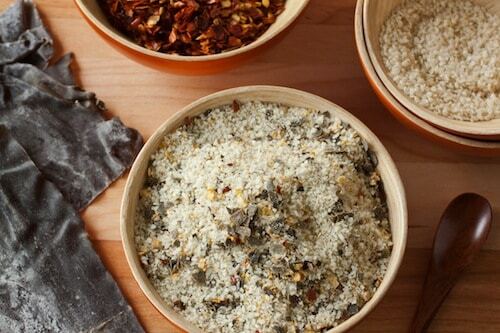 Togarashi salt, based on the flavors found in a Japanese spice blend, brings together a bunch of first-rate tastes—spicy chili and peppercorns, sweet citrus, almost-creamy sesame seeds, and a saline hit of seaweed—for a punch in every pinch. This salt is a powerhouse: it’s unsurprisingly fantastic on grilled fish and shellfish, but it adds a little something-something to your mom’s chicken soup, makes all manner of vegetables into show-stealers, and works amazingly well as a dry rub for pork and even Thanksgiving turkey. It just goes to show that when it comes to flavored salt, you basically can’t go wrong. It’s a much better five-minute trick than throwing another frozen dinner into the microwave, right? Toast the sesame seeds in a small skillet just until they’re fragrant and starting to turn golden, then remove from the heat. 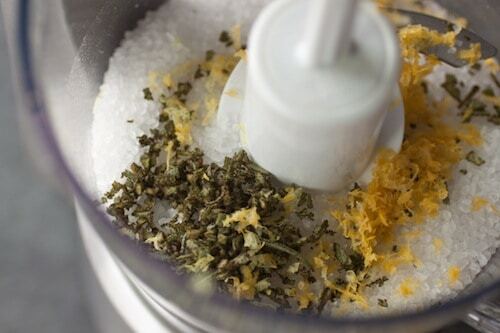 Break the seaweed into small chunks if using sheets, then add to a mini food processor with the black peppercorns. Pulse until the seaweed and peppercorns are ground to a coarse powder. Add the reserved sesame seeds, chili flakes, orange zest, and salt to the food processor and pulse again until blended. Spread the salt on a rimmed baking sheet in a thin layer. Turn the oven off, then place the baking sheet in the oven, letting the residual heat dry the salt for a half hour. Remove the salt from the oven and let it cool to room temperature on the baking sheet, then transfer the salt to a sealable container like a Mason jar. Because the natural oils in sesame seeds can make them go rancid after a while, this salt should be stored in a cool, dry place and used within a year.